The School of Cebadilla de Abangares, Guanacaste serves 15 children from ages 7 through 12 years old. The students served by the school come from families with few economic resources. The Rangers and Monteverde Medical Corps seek to educate men and women in a holistic way by helping them to develop all kinds of skills in a large variety of fields and service. The Monteverde Conservation League is a non-governmental, non-profit organization whose mission is to preserve, conserve, and rehabilitate tropical ecosystems and their biodiversity. 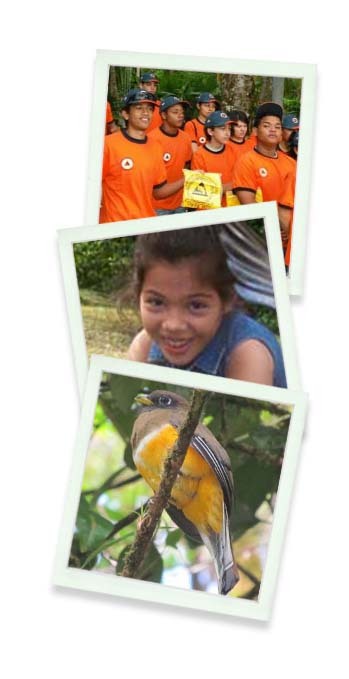 They administer the Children’s Eternal Rainforest, which is the largest private reserve in Costa Rica. It covers over 22,500 hectares of tropical forest and is engaged in conservation activities and environmental education. The Santa Elena Preserve was created, thanks to the determination of the community, to share tourism benefits and use them as tools for common development. Proceeds are used for the protection and management of the reserve and to provide a better quality education in the school and surrounding schools.